A former demolition worker who lost this job shortly before his parents both died has been forced to live in a PHONE BOX – because he refuses to accept state handouts. 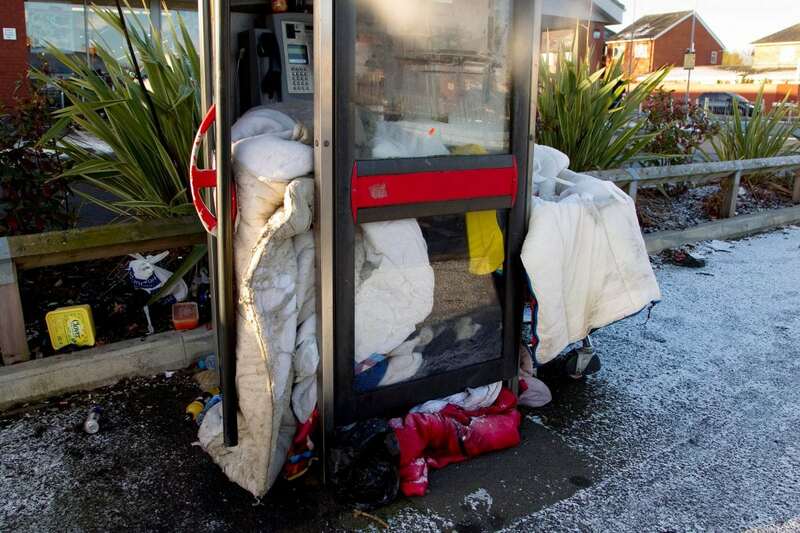 Stephen Pope, 42, crams himself into the 3ft-wide BT kiosk every night, using only a filthy sleeping bag and a ripped duvet for warmth. Shocking images show the makeshift bedroom, which is full of old rags and bits of cardboard box which Stephen uses as insulation. 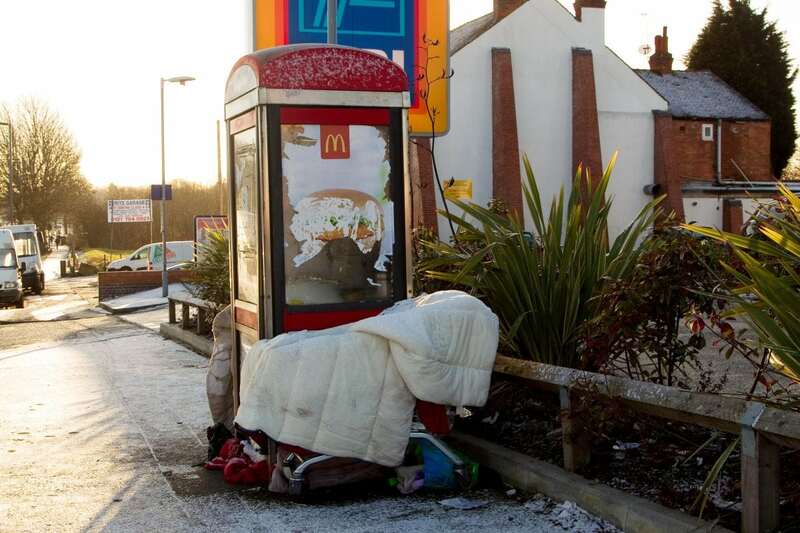 The former demolition worker has been living in the phone box, which is opposite an Aldi supermarket, since last October. Now Stephen – who does not beg or claim benefits – is living off donations from strangers who pass him in Bordesley Green, Birmingham. Speaking yesterday (Mon), he said: “It’s horrendous, having to sleep here day in day out but I have no choice. I don’t want to claim handouts. I just want to work and pay my way. “There’s next to no space, and I have to crumple my body up just to get to sleep at night. “Thankfully it’s a bit of protection from the wind and snow during the night time which keeps me and my stuff dry, but it’s not much of a life. “It’s better than being out in the cold, I think, but it’s still pretty horrific. “In all honesty, I’ve got used to living off next to no sleep, because it’s so uncomfortable and cramped. “During evenings and night, you do get people coming up to the box and shouting at me, banging on the glass and sometimes getting in, which is scary. “Every night, I just cling on to the duvet and wait for the sun to rise again, which often feels as though it takes a very long time. “It’s like I’m in a human zoo or something, people are always trying to peep in at me. “On the other hand, you do get people stopping by with hot drinks, food and money, which just shows that people do have a heart. Stephen first became homeless four years ago after his parents died within a few months of each other and he was forced to move out of their home in Yardley, Birmingham. He said: “I have a brother and friends who can help out, but I don’t want to be a burden on other people. I’m a proud person. I used to have a job and a home but it all just vanished. “At the end of the day, I got myself into this situation, so I should be the one to deal with it. “I’m not going to be the sort of person that’s a burden to other people, that’s not what I’m about. “I used to work in demolition for money, and my parents let me live with them while I tried to save up to rent somewhere. “Then about four years ago, everything started to unravel. They passed away fairly suddenly, and I couldn’t cope. “I lost my job, lost the house and suddenly had nowhere to go. “I spent three and a bit years living out on the streets round here, and I managed to make friends with some people, and we call tried to support each other. “But I’ve not been able to cope because these people have been turning to Black Mamba, which is a horrendous thing. “People have had their personalities changed, and I’ve lost lots of friends to it. I decided that I had to get out, because it was dangerous and the people around me were becoming bad influences. “Personally, I don’t do drugs or drink or anything, I never have done and refuse to do so. For me, I prefer to spend the little money that I get on food and drink. “The dream is to one day find my feet again, and be able to get my own flat and a job. “I don’t want to spend the rest of my life living in a phone box or on the street, I just want a second chance to make something of myself.